I'm beginning this new round of blog posts with some thoughts I've been having recently on the interrelationship of music, its place of origin and the community that it serves. These thoughts were inspired by an experience I had the other week at the Greek Institute in Cambridge, MA. My friend and colleague, Chris King (whom you may know as the engineer who is responsible for the amazing digital transfers of all the records in my collection), recently published a book, Lament from Epirus, about his fascinating and very personal journey into the music of Epirus and the geography which created it. 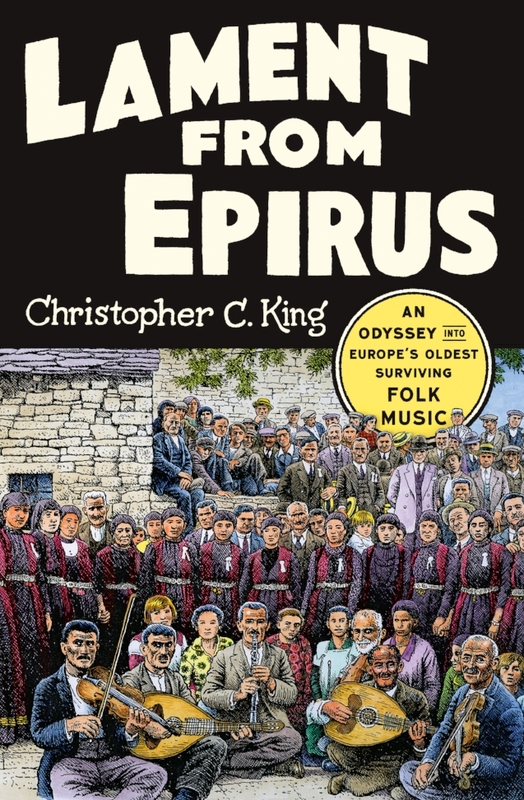 One of the aspects of the book that I found most compelling was his description of the way in which a recording, the eponymous "Lament from Epirus" recorded in 1926 by violinist Alexis Zoumbas, grabbed Chris by the lapels and dragged him forcibly into immersing himself completely in Epirote culture. I could identify with Chris's experience because of my own relationship with both klezmer and Hawaiian music. The event held on a lovely spring evening at the Greek Institute a couple of weeks ago was billed as a lecture with live music. The room was small but absolutely packed, and most of the people there were clearly of Greek ancestry -- many spoke English with an accent. Chris began by playing the 78 rpm disc that had started him on his journey, and as the room filled with the masterful sounds of the violin, the excitement in the room was palpable. That music clearly spoke to that audience not nostalgically, but in the present, with the entire gamut of emotions experienced by people who were at once of a place and far away from it. After Chris's talk, two very fine musicians playing violin and lauto performed a couple of traditional tunes, to an equally rapt and enthusiastic response. But what was most interesting to me was what happened after the event was over, when everyone was milling around chatting and talking with Chris. I heard person after person describing his or her own visits to Epirus or an experience with the music or a longing to reconnect with the place from which their family had migrated. One young man (without a Greek accent) told Chris that he was in the process of getting his dual citizenship (American and Greek). I found that response all the more striking because it's not possible for those of us whose Jewish families came from Eastern Europe to go back in that same way. There is no "there" there any more, not really. It's possible, I suppose, to feel nostalgia for the flourishing Yiddish culture on the Lower East Side of New York and other turn-of-the-20th-century urban enclaves, but they don't exist any longer, either. Through KlezKamp and similar events and festivals, we have, however, managed to reanimate the music as the connective tissue of community. Klezmer musicians again function as kley koydeshi, holy tools, helping to celebrate occasions (weddings, brisses, holidays) essential for the continuity of the Jewish people. For many, the klezmer revival (actually a Yiddish revival) has led to a strong sense of Jewish identity, and people have embraced many of the traditions embedded in the music as a vital part of their own lives. This got me remembering a post-KlezKamp visit, one December long ago, to a Greek nightclub in Astoria, with Kurt Bjorling, Eve Monzingo and Alicia Svigals. We went to hear a band with whom Alicia sometimes performed, and the whole experience was kind of mind-blowing. Here we were, late on a Friday night, in a club full of young people dancing to music that sounded both traditional and modern. It made us wonder what klezmer would have been like in the late 20th century, if it hadn't been uprooted. And then there is Hawaiian music, the other culture with which I am most familiar. From my very first visit I felt about Hawai'i rather like Chris describes his feelings for Epirus. There was a sense of belonging to the place and the culture that makes no sense empirically but is very real nevertheless. Hawai'i is a very musical place; every mall and shopping center has a stage with free hula shows, jam sessions and 'ukulele lessons, and so many of the people who visit yearn to interact with the music in some kinetic way, often regardless of whether they have ever played an instrument or danced before. I believe the reason they are pulled in that way lies in the extent to which Hawaiian music is totally rooted in the land. Longing to be part of the music is actually longing to be connected to the place. Most songs/hulas are about physical locations, at least on the surface, and the sounds and rhythms of performances are rooted in the movement of the waves, the roar of the surf, the rains and the wind and all the other natural phenomena that make Hawaii unique. While music certainly binds the community, it doesn't serve it in quite the same way as klezmer, and communal aspects of the culture seem to recede in view of the preeminence of connection to the land itself. Music, country, community. All three are essential elements of human life. How fortunate we are that we can explore cultures beyond what we find in our own geography.